Awhile back we told you about a DCT rumor we had heard from several sources over the past year. While we still hadn’t confirmed it at the time, it was strong enough to bring to you and a sketchy but interesting rumor. Today we’re here to go further and confirm that MINI will indeed be offering a dual clutch auto-mated manual transmissions. And we’ll go even further and tell you the fact month of production it will start. For years MINI has lost to VW (among others) in automatic transmission offerings. While the generation III 6 speed Aisin that debuted with the 2014 F56 MINI went along way in closing the gap, it didn’t eliminate it. Next for MINI was the 8 speed Aisin they released in the Cooper S Clubman (and 2017 Countryman). With thought the 8 speed was MINIs potential answer to the automatic arms race. However we now know that’s simply one part in a two part strategy. 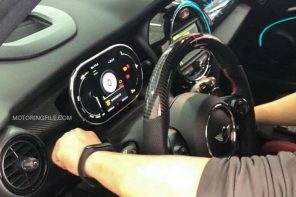 Thanks to sources familiar with the brand’s upcoming plans, we can confirm that MINI intends to offer dual clutch automatic transmissions starting with November 2017 production. While we don’t yet know details of what models they’ll be found in, it’s a safe bet we’ll see the DCT option in the Cooper S and JCW models (if not more). And that date? Not coincidently that’s right around the time that MINI’s mid-cycle refresh for the F56 will begin production – as we had estimated earlier. Beyond the F56 we’d expect MINI will eventually introduce the transmission in all its small UKL based models (The F55, F56 and F57) while keeping the likely smoother 8 speed Aisin for the larger MINIs. Moving from a torque converter automatic to a DCT is an interesting change of direction for BMW – a company that has thus far eschewed the use of dual clutch transmissions outside of M models and a rare Z4. The reason is that costs for dual clutch transmissions are typically higher given the complexity in design and manufacturing. The only way VW has been able to do it in mass is the sheer volume they can leverage. What appears to have happened is that BMW and MINI found a willing partner ready to bring costs down in order to battle the increasingly popular 8 and 9 speed automatics from ZF and Aisin. This change will also have the benefit of further differentiating the smaller MINI offerings from the larger four door products that use the (very good) 8 speed torque converter automatic form Aisin. Ok that’s a bit dry. What it’s really saying is that dual clutch transmissions use two clutches to allow for much more responsive, crisp gear changes. DCTs (as they’re known) shift quicker, and yet are nearly as seamless as the new breed of 8-9 speed torque converter automatics. They also offer similar MPG figures to the best automatics out there. In other words they offer more the performance without too much of a downside. Well that’s not entirely true. For automakers they have proven to be expensive to produce and a little less reliable than the standard automatic. However with DCTs being on the consumer market for almost 15 years now, reliability doesn’t seem to be the issue it once was. Additionally suppliers that produce the transmissions are creating quicker shifting units in manual mode while allowing for more comfort in full auto mode. Pricing for the option will be interesting to watch. Currently BMW prices DCTs as a luxury option. The new M2 for example offers a DCT for just under $3,000. However VW prices their 6 speed DCT (they call it a DSG) for only $1100. We’d expect MINI to be somewhere just north of that and very close to the $1,500 they currently charge for their 6 speed torque converter auto. We’ll have more on MINI’s dual clutch plans along with other changes to expect for the 2018 F56 & F55 refresh soon.